March 2015: With only days before the opening round of the 2015 MX Nationals season gets underway at Horsham, Team Raceline Pirelli Suzuki rider Rhys Carter says he is raring to go for the weekend. With an injury to MXD teammate Brock Mcleary forcing him out of the round one event, all eyes will be on Carter to see what impression he can make in the MX2 class. Carter has had an uninterrupted pre-season in the lead-up to the series, and says that he is feeling very optimistic about the weekend despite having never competed at the Horsham venue. “Yeah I’m looking forward to it – I’m in a similar position to what I was last year where I don’t really know where I’ll stack up against the good guys. I’m excited to be with Raceline – they have been a huge help already so I’m looking forward to it. “I haven’t actually been to Horsham before, so I’m really looking forward to going out there having a look at it and riding on it. “The aim for the weekend is basically to come out of the first round healthy with some solid points to start the championship. I’d like to be around in the top-five somewhere, and even if it’s a couple of spots off that I’m not going to be too worried. “It’s a bit disappointing with Brock hurting himself, but Rhys is looking pretty good on the bike so I can’t wait for the opening round to get underway. “Horsham is an interesting venue – it has its days. If it’s wet it will be boggy and pretty hard going but I think our bike will suit that. We have a good package for that kind of track – nice and tight to dig deep in those big ruts, that’s right up Rhys’s alley. “For round one and for most of the season, if we can average a top-five spot we’d be pretty happy, and then we could give it a shot at the end of the series and see how that goes. Stay up-to-date with all the action from round one and see how Rhys and the team perform by keeping an eye on the Team Raceline Pirelli Suzuki Facebook page. Click here for Andy McGechan's article. Rookie New Zealand teammate Rhys Carter has been a picture of consistency since joining Moss aboard a Team Motul Suzuki RM-Z450 this season, sitting eighth in the standings and well within the hunt for a top five. Carter has been at home refining his program during the annual mid-season break, now heavily focused on finishing the season strongly in a bid for further top five results. He too is a fan of the calendar's closing tracks. "I've been riding for the past few weeks and it's been getting better each time," Carter explained. "I feel like my speed is particularly getting faster, my starts are good and my fitness is even better than it was so I am happy going into this weekend. "The circuits coming up are good for me; Swan Hill is a good track, Raymond Terrace was tough for me last year but I hope to improve and Conondale is good for us Kiwis. Gladstone I hear is a good place, and no doubt Coolum is a favourite." Behind the helmet with Team Motul Suzuki's MX1 rookie. Probably rolling around the sighting lap at the Motocross of Nations at Teutschenthal, Germany, last year. Being selected to represent New Zealand, seeing the crowds and soaking in the atmosphere was a cool feeling. Probably the last moto of the Des Nations. The track was rock-hard, rutty and slippery, the late afternoon sun was in my eyes and I was tired. It felt like the longest moto in the world. I finished 32nd or something. The qualifying was my best result – I placed 12th in that, which was awesome. To try and make it properly in Australia. I want to race there for the next few years, improve each year and get a solid longer-term contract with a factory team. I’d love go to the US, but I want to make it happen in Australia first and see what happens from there. Whakatane in the Bay of Plenty. I grew up racing there on a 50 and I still enjoy every race there. It’s a flowing, natural terrain type track and has this weird surface. It can be loamy and almost sandy in places, but can also get hard and slick sometimes. Probably a signwriter. I did it a bit for a motorcycle graphic company before I went full-time racing. I enjoyed it and would definitely look into it again if I had to give up racing. Everyone, I guess! I seem to battle different people all the time, but if I had to pick someone it’d be Brad Groombridge, seeing as he’s one of the guys still racing who I grew up with. Ben Townley. He’s from New Zealand and did the move overseas when he was young and had some tough times. I know him as a friend and it makes it feel more doable to do. I know what he went through and how he got to where he is, and that’s been a big inspiration to me. I used to have heaps like put a knee brace on a certain side and never go out for dinner the night before a race, but I’ve got rid of them all during the New Zealand Nationals because they didn’t seem to be working. I just want to have fun instead. Cycling, running, crossfit with my trainer in the gym, and riding three times a week, including on the weekend. I want to finish the season off in the top five to 10. I know where I stand and what I can achieve. If I can finish in the top six, seven or eight after my first year on a 450 I’ll be happy. Suzuki just wanted me to have fun and were happy if I’d gain top 15 placings, especially as I’d never raced a 450 before this year. The Great Outdoors. I love the whole series. I like the depth they go into with the teams and behind the riders and their perspective on things. It’s a good insight into the sport. Surfing and golf. Last year I got my handicap down to 14 but I was playing too much and I’ve pulled right back now. I’ve gotta keep training to hang off the bigger bike. I never used to, but this year I have been so I understand what’s happening on the track and to get the message from the mechanic. A 2001 Toyota Hiace. It’s my mum’s van – we’re on a tight budget here in NZ! I don’t really read, to be honest. I’d rather watch a YouTube video. I guess it’s a mix of dance, hip-hop and party music. I’m not really a huge music fan – I just listen to whatever’s on the radio or whatever the girlfriend’s playing. Getting to travel around Australia, seeing new places and hanging out with everyone. It has a cool atmosphere and I really enjoy it. Who will win the 2014 AMA Motocross? I should say Bubba because he rides Suzuki, but I think Roczen will do it. I used to be a fat kid. At primary and intermediate (years 6-7) I was actually the prop in the rugby team. Me and Ben Townley were both fat little buggers. A homemade PW50 bitser that dad and his mate built for me. It was probably at primary school when I was 9 or 10. I think I was in the corridor heading to class after lunch and gave the girl a quick kiss before I left. I can’t remember who it was or anything; it’s too long ago for this kid. When I was 14 I snapped my wrist at the Tokoroa Supercross and put the bone through my arm. At my second year at college I got jumped by 15 Maori dudes on the rugby field because I didn’t want to play with them. It didn’t end very well for me. That’s Rotorua for ya. Despicable Me 2. It’s awesome. After the Des Nations I had four days off in London. That’s about as much of a holiday as I’ve had before I had to get back into training and riding for the upcoming New Zealand summer season. Before Wonthaggi I had a big get-off at a sand track at Mangakino. The bike stepped out on me coming out of a turn and I went over the bars and landed on my back and head. I was pretty sore after that one. Monster, Red Bull or V? I don’t do them, but I’d take a Red Bull if it came with a vodka. MX Nationals – I haven’t done a lot of supercross. Blonde. My missus is blonde so I’ve gotta say it or I’ll be turning up to Swan Hill single! When Mount Maunganui’s Rhys Carter was selected to represent New Zealand at the Motocross of Nations event in Germany late last year, he knew all his hard work and dedication to the sport had finally been recognised. But questions were also posed about the decision to list him as New Zealand’s MX1 class entry in the three-rider squad. Traditionally an MX2 (250cc) class rider, the Bel Ray Pro Rider Suzuki Team member seemed an odd choice to campaign the mighty Suzuki RM-Z450 bike in the MX1 class at this big annual international event, often referred to as the “Olympic Games of Motocross”. But he soon proved the doubters wrong, putting in two solid rides against the cream of the international scene, the young man from the Bay of Plenty muscling up to such high-calibre riders as American multi-champion Ryan Dungey and seven-time world motocross champion Antonio Cairoli, from Italy. While Team New Zealand finished only 20th outright of the 40 nations entered, Carter had proved himself a competent big bike racer and he returned home with fresh confidence. Carter hopped back on the smaller Suzuki RM-Z250 to crusade the four-round New Zealand Motocross Championships at the start of this year, putting his fresh international experience to good use as he challenged for the No.1 spot in the MX2 class. However, a few too many crashes meant he eventually had to settle for seventh overall. It was a bright spot that he did win the final race of the series. Then, no sooner had the dust settled on his domestic campaign, Carter was again looking off-shore. Following his MX1 class debut in Germany, there was less of a surprised reaction when he headed across the Tasman at the start of this year to tackle the MX1 class in the 10-round Australian Motocross Championships. The Australian series has reached the halfway stage, with the next round set for Swan Hill, in Victoria, in just over two weeks’ time, and Carter is the best-performed of the Kiwi riders in the MX1 class, currently eighth in the championship standings, just seven points behind seventh-ranked Australian rider Hayden Mellross. “I set myself a goal of finishing top-10 in Australia, so I’m pretty happy with how things are going at the moment,” said Carter. “I was fifth overall after round one and that was pretty mind-blowing. “Jay Foreman, my team manager in Australia, is very happy with how I’ve been performing and I’m only nine points off sixth place overall. “I had a bad weekend at the last round in Australia, but there are still five rounds to go, so anything can still happen. “I’ve learned a lot about racing the RM-Z450, like riding it in a higher gear and not being so aggressive on it. Carter says he wants to stick with the RM-Z450 when he returns home, the 24-year-old’s phenomenal rise from MX1 rookie to contender in less than 12 months now complete. Team Motul Suzuki rider intensifies training program. 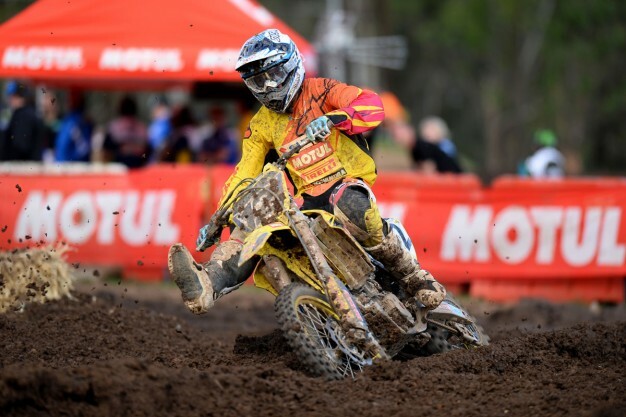 Team Motul Suzuki MX1 rookie Rhys Carter has undertaken an intensified training program in the lead-up to this weekend’s Murray Bridge round of the Monster Energy MX Nationals, eyeing a strong middle sector of the 2014 season. Carter has been a revelation in the premier class alongside defending champion Matt Moss to date, consistently knocking on the door of top five finishes in what is his rookie season aboard the RM-Z450. He’s currently seventh in the title chase. “All the additional bike time between rounds definitely helps and I’ve been on a harder training program during the past three weeks,” Carter explained. “I want to get stronger in the last half of the final moto, so that’s important entering the next two rounds. “I’ve been working on my intensity on the first lap, which is what I have been lacking, so the plan is to put it all together as we learn more from week to week and build experience. Carter was fifth on debut for the team at Broadford and eighth at Appin, before Wonthaggi’s most recent round saw him rally to another confidence-inspiring sixth overall. 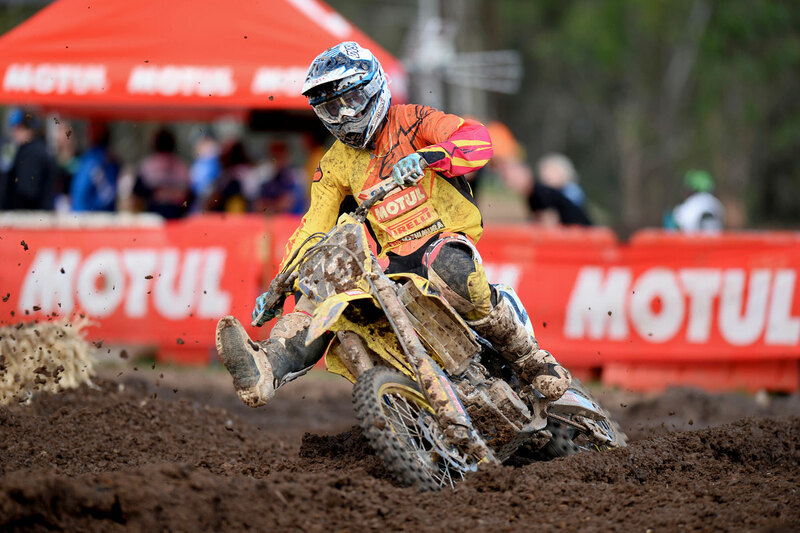 Rhys Carter (Mt Maunganui) has stepped up to the Pro Open (450cc) class with the Motul Suzuki squad and finished sixth and eighth in the two 30-minute motos at the Wonthaggi track in Victoria on Sunday. Team Motul Suzuki rider Rhys Carter was eighth overall in the MX1 Appin event, carding seventh in moto one and ninth in the second. The result sees him now tied for sixth in the standings after another promising performance. "It was a good day for me," Carter said. "The first race was really good for me - I crashed a few turns in and went back to nearly last, so to finish seventh was good. My speed was definitely good. "In race two I struggled a bit with the hard-pack surface, so that's something I need to spend more time on, but ninth was still a decent result considering. Overall the weekend was another good one for us." Motul Suzuki's second rider for 2014, Kiwi Rhys Carter also impressed at the opening round finishing just a single point behind Mackenzie in 6th position. Finishing with a score card of 6-7-6 Carter showed he could be a real dark horse for a top finish in this year’s championship. Do we know who Rhys Carter is yet? Sixth place in MX1 says yes. When Carter signed for Team Motul Suzuki alongside defending champion Moss, we won’t blame you if you said “who?”. He flew under the radar to sixth in MX2 as a privateer last year, but this year the Kiwi is definitely on the map as a full-factory rider. With sixth overall and a very consistent showing, he’s already proving his worth as a rising star. Winning form at the final round of the New Zealand Champs has given Mount Maunganui motocross racer Rhys Carter plenty of momentum as he prepares for a factory ride in the Australian Championship which begins this weekend. Carter will step up to a 450cc Suzuki for the 10-round Australian Nationals, joining the Motul Suzuki squad as teammate to reigning champion Matt Moss. Carter says discussions to join the team began early in the New Zealand series and the ride was confirmed a couple of weeks ago but was only announced at last weekend's final round at Taupo. "It was first talked about at the first round (of the NZ Champs) and it all came together a few weeks ago but the team has waited to get the press releases out," said Carter. Carter, 24, had some promising performances in the final two rounds of the 2012 Australian Champs and last year rode the full Australian series as an Pro Lites (250cc) privateer. A strong second half of the season produced sixth place in the title standings. The step up from a 250cc bike to a 450cc Suzuki and the Pro Open class won't be an unknown quantity to Carter. "I rode a 450 at the Motocross of Nations (in Germany) last year so it won't be completely new to me. "And last year racing in Australia was a valuable experience and it means I know the tracks which will help me." Carter had gone into the four-round New Zealand Champs with high hopes after finishing third in the MX2 class last year. A first round crash and riding while unwell at the third round left him out of title contention. At the final round in Taupo on Saturday he delivered his best performance with a second, fourth and a victory in the final race of the series. He missed out on the overall round win on a tie-break decider with Hamish Dobbyn and finished the season in seventh place. #43 Rhys Carter lined up next to #1 Max Nagl (Germany), #73 Jonathan Barragan (Spain) and #46 Metevz Irt (Slovakia) in Saturday's MX1 Qualifying - Carter was 12th which has to be one of the highlight of his weekend - 12th out of 41 in the world. Crashed majorly in moto 1 (click here for the photo sequence), minorly in moto 2 so finished 19th overall in the round. "It was just one of those things", says Rhys, who's back home between motos. "It was a high speed turn so I was pretty lucky. I wasn't hurt and the bike was OK so we did the second moto. Unfortunately I crashed in the second race as well - washed out the front - but the bonus is I know the speed is there." Rhys Carter had a tough afternoon. He won the day’s first race but was then involved in several handlebar-banging incidents and had to settle for seventh and fifth in his next two races. However, Rhys remains third overall in the championship standings and even improved his position to now be just 13 points behind the No.2 ranked rider, Australian Brock Winston. Rhys Carter had a mixed day in the MX2 (250cc) class but he remains well-positioned to again finish the championship on the podium. Carter took his RM-Z250 to finish 4-10-3 in his three races, uncharacteristically crashing twice in race two and both times impressively fighting back through the talent-packed field. "I felt confident today but I think I rode over my head in race two and the crashes cost me dearly. At least I have solid points on the board and I achieved that at an unforgiving track. I think I can move forward from here." 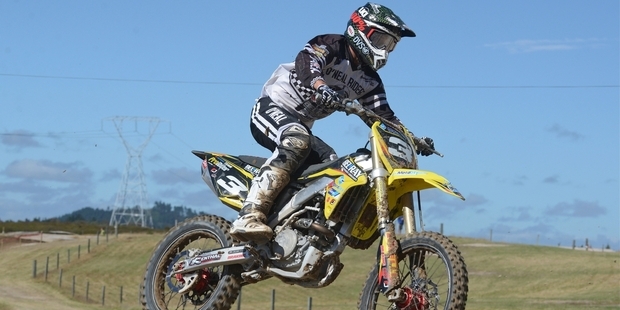 DECEMBER 31, 2012: The MX2 class was an absolute thriller at this year's 41st annual Whakatane Summercross, with perhaps any one of five or six riders capable of snatching race wins. And while three separate individuals shared the race wins during the soggy day of motocross action, it was Mount Maunganui's Rhys Carter (Bel Ray Moto City Suzuki RMZ250) who took the ultimate prize, the trophy for winning the class overall. Carter never finished below third all day, his consistency ensuring he wrapped up the overall win, albeit by just one point from Taupo's Cam Dillon, but it was his last-race, last corner pass on Queenstown rival Scotty Columb that was the highlight of the day. "I only qualified eighth overall, so it was not a good start to the day. But it all worked out in the end," he shrugged. "But I have a little bit of work to do on my fitness before the nationals." Bel Ray Moto City Suzuki race team manager Andrew Hardisty, of Mount Maunganui, was ecstatic about the outright win. dug even deeper. It was his consistency, a strong will and heart that gave him the win today." Time and again, Carter pointed his RM-Z250 into the axle-deep bogs and, time and again, he powered through, plastering his rivals in the process. Prepared by the Moto City performance division, Speed Shop, the bike never skipped a beat all day. Tuesday 05 April: Hey guys sorry it taken a while to get this out - had no internet at the house. Final Round of NZ MX Champs at New Plymouth - MX2 Class. Edited by Alan H.
Practice/Qualifying: So it rained like crazy for the days leading up to the final round of the Champs and on the morning of the event it was rumoured there was only going to be two rounds. So we went out for practice and qualifying - they gave us the usual 30 minute session. On the first few laps it wasn't too bad but it started to get technical. On the fourth lap my bike started missing and didn't sound too good so I managed to do a half decent lap and pulled off to get my bike sorted. Moto 1: Being another concrete start and with it being wet, made it tricky to get a good jump. Somehow I managed to and came round the first turn in 5th which was good. I moved into 4th within the first few laps and was feeling good 'till coming down this slight down hill bend the front went from me and I went down, losing a couple spots. I got back going and tried to stay upright and get as many points as I could. Then I made a stupid mistake and stalled it going into a corner. By the time I got my bike going I had dropped back to 9th and was there 'till the end of the race. Moto 2: Hoping for another good jump like the first moto but for some reason I just spun and was third-to-last going round the first corner. I put my head down and avoided all the carnage that was happening and stayed on my bike and slowly worked my way through the pack. The track at this point was gnarley, it had ruts everywhere and was hard underneath. It was like ice in some spots and was a technical track to get around. The 2 lap board come out and I managed to get past one more guy and put myself into 6th for the moto which I was pretty happy with considering my start. Moto 3: I got another average jump out of the gate and was sitting mid-pack going round the first turn. I again avoided the carnage on the first few laps and just stayed upright untill everything had settled down. I got myself into the top 10, then my shoulder had nothing left and all I could do was just cruise round and try stay on the bike. I ended up 11th in that moto and was not happy with that as I couldnt push and get myself good points. Championship 6th overall. The Nationals this year went really fast and before I knew it they had come and gone. I am pretty happy with my result after only been on the bike three weeks before the first round. Having had nine months off with my shoulder and was not even going to do the first two rounds but I think I rode the best I have and used my head alot and didnt crash my brains out like previous years. I felt like I adjusted to the Suzuki real good and with Baz at Speed Shop getting it sorted and Jimmy at Performance Factory doing my suspension really made a difference on how my bike handled - it was amazing. A big thanks to my parents again for coming all over the country to the races, my family for travelling to a couple rounds, Coops for working on things that he found I struggled with and made a huge change to my riding, BT for all the bits and pieces he has put towards me. Ricey for getting the pics for me over the rounds you did a sick job. To all my sponsors that have been there for me again and also my new sponsors that jumped on board and helped me out. Not having the best results over the last few years I can't thank you all enough and hope to carry all this on to the future: Moto GB, Speed Shop, Loose Kid Industries, DVS Shoes, Protege MX, Fox, Shoei, Skull Candy, Addiction, Pirelli, EBC Brakes, Rice Photography, Tsubaki Race Chains, Supersprox and Repsol Oils.